Lizardqueen and I left for Australia Nov. 3, first visited Rainbow Beach and Fraser Island, then went on this Mike Ball Spoilsport dive liveaboard for 4 days to Cod Hole and the Coral Sea. http://www.mikeball.com/4-nights-fly-dive-coral-sea We flew back to Cairns low over the Great Barrier Reef from Lizard Island, aptly named by Captain Cook. No surprise we were in Cairns for the total eclipse. The Cairns/Port Douglas area is very popular for tourism. However a tropical climate with onshore winds and mountains rising just a few miles from the coast is not a recipe for clear skies. Consequently we flew to Pormpuraaw on the other side of the Cape York peninsula where it was clear. This was a $530 option offered by our knowledgeable local Aussie tour guide Joe Cali. The City of Cairns was clouded out. Beaches north of Cairns varied. Some were in lucky holes and saw all of it, some only got 10-15 seconds out of the 2 minutes. Those who drove 2-3 hours inland behind the mountains had clear skies. That's about as far as paved roads extend. Joe and many of the serious eclipse chasers drove inland (even if they had reserved the plane) as they could take more astronomical gear with them and the last minute forecast was at least as good there as for us. We did have a scare. We arrived at Cairns airport for out 3AM flight only to find that the individual who was supposed to fuel the aircraft had slept in and could not be found. We were in process of recalling our checked bags at 3:30 for what would have been a hair-raising race over the mountains when the fuel guy showed up. We finally got off the ground just after 4AM. We're with Michael Gill, administrator of the Solar Eclipse Mailing List. We informed him when he arrived that he's also a matchmaker. Michael is from England and may join us at Jackson Hole in 2017. Sunrise at our viewing location. To make up for the fuel delay they provided a van to shuttle us here instead of having to walk ~2km with all our gear. Some of our group setting up. 18 of us who paid for the flight actually used it. This included a couple from SF with 3 young kids, all seeing their first totality. Even though the current solar maximum is weak by historical standards it was a typical solar max eclipse with a symmetric corona and big prominences. During the partial phases I was able to see 11 sunspots. The diamond ring is about to start at 10:30 o'clock on the Sun. After 3rd contact about half of us went to an aboriginal art gallery. Liz got info about one of the artists but we didn't buy anything. Australia is very expensive with the Aussie $ being ~$1.04US vs. 76 cents when I was here before in 1997. Tomorrow we leave Cairns and will spend the second half of our trip in New Zealand. 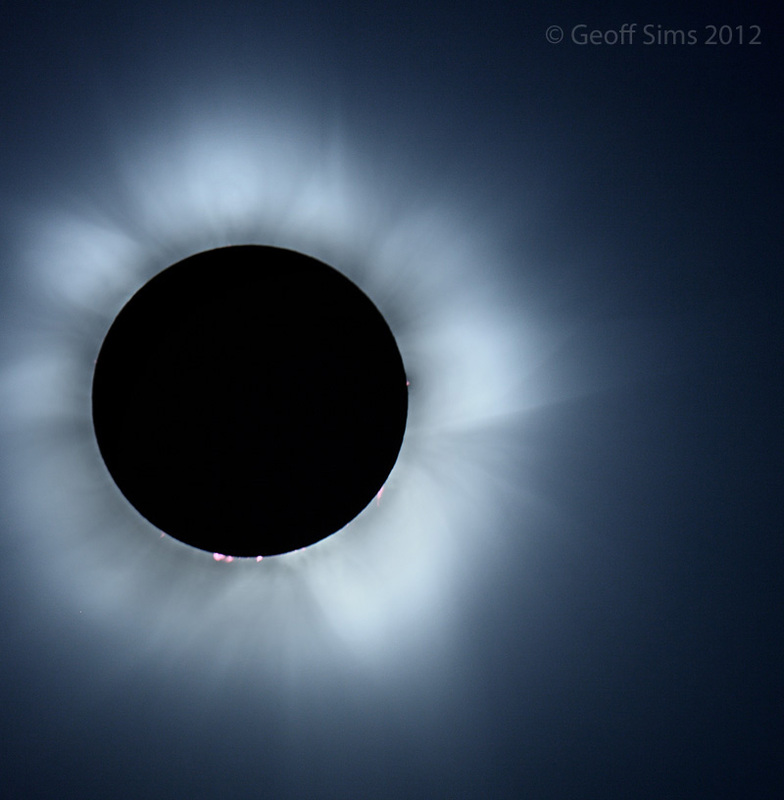 A few more pics from some very capable Aussie eclipse chasers with us in Pormpuraaw. Alex Scutt took this picture of Liz and me viewing the eclipse. 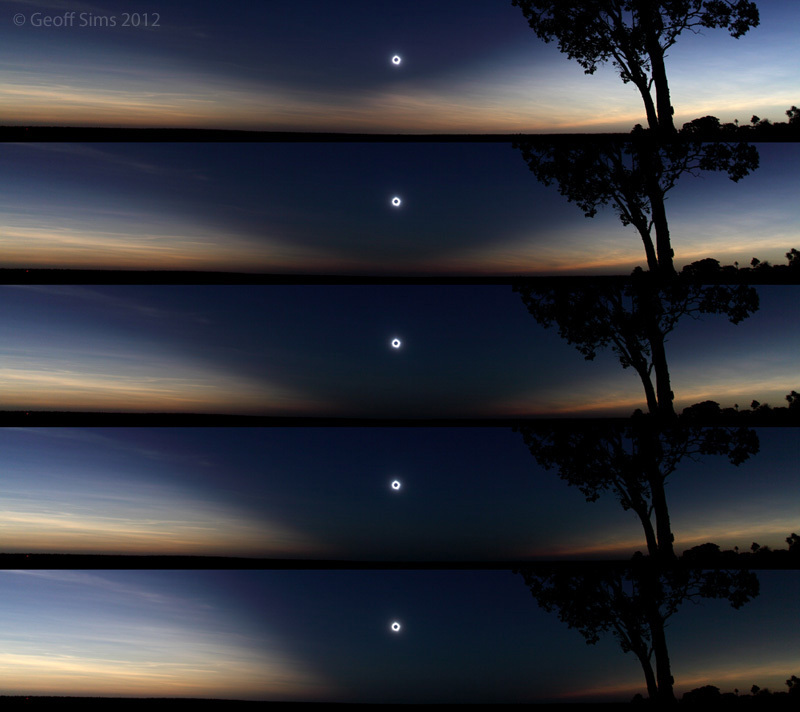 Geoff Sims made this overlay of partial and total phases. 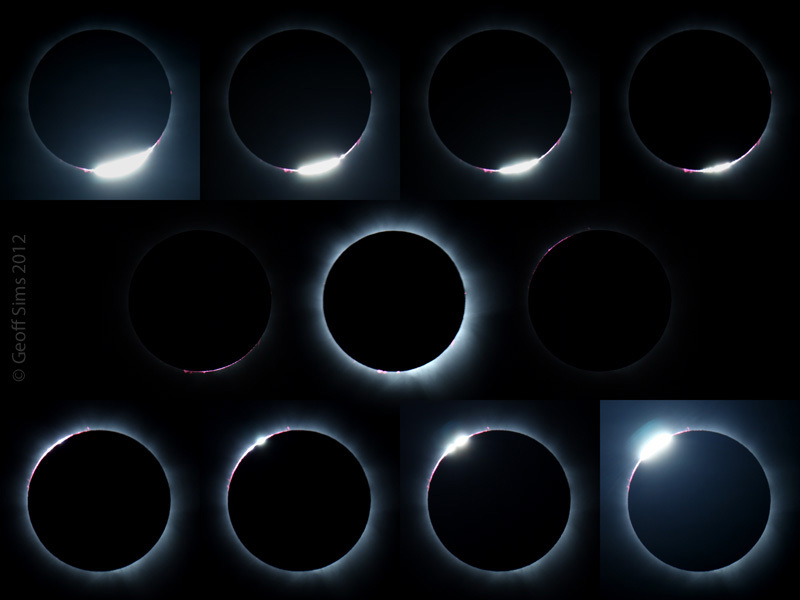 And also this sequence during totality showing movement of the umbral shadow. Here Geoff shows how eclipse closeup pics should look. These are all done with a DSLR hooked up to a laptop with preprogrammed exposures. In May 2012 Admin and I met at Lake Powell for an late afternoon annular eclipse. 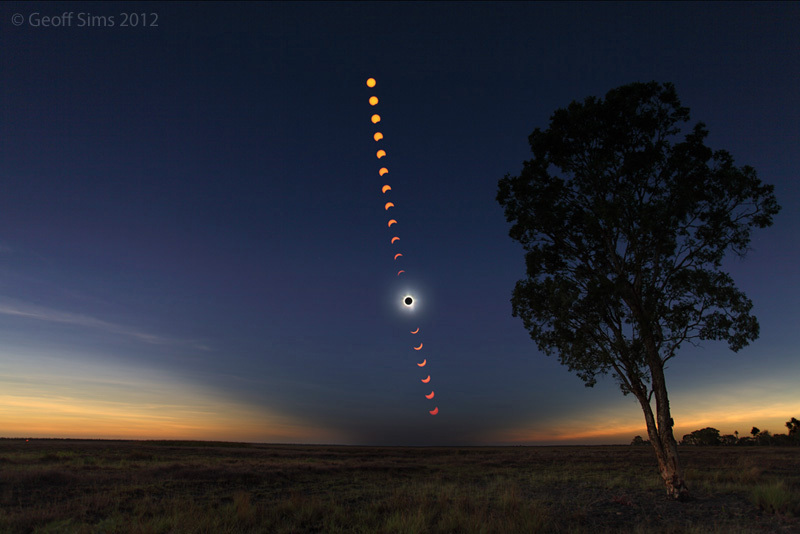 This May there was an annular eclipse in Australia which Geoff chose to see very close to sunrise.